The product of Jon Ritman and Chris Clarke, Match Day was the first Speccy football game with decent graphics. When not being controlled by you, players behaved intelligently on their own, which was a massive leap from the likes of World Cup Football. 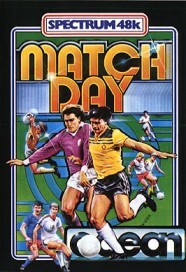 In March 1985, a trio of reviewers at Your Spectrum gave Matchday 5/5, 4/5 and 4/5, which made it an instant hit. I didn't play this game until after Matchday II had been released, with its improved graphics, barging, kickometer and much talked about diamond deflection system, but I can see why it was such a hit at the time - and it definitely rates as one of the best Speccy footy games of all time. However, I do seem to recall horrendous pixel clashes when players came into contact with each other and the ball, which would change colour. Am I correct? Useless fact: Crash magazine once held a Match Day tournament involving six readers and Ritman, Clarke and Bernie Drummond. In an afternoon of playing Ritman thrashed the opposition, winning all his games and scoring 38 goals. I think this Donald Campbell effort was the first football game I played on the Speccy, and it was damn addictive. My strongest memory is winning the World Cup with Wales and thrashing the opposition about 4-0 in the final. This was due to the fact I realised that if you shot from a certain angle, the ball would always go into the net. But if you blasted it straight, it never did. The graphics were pretty basic, as you would expect for a game released in 1984, and the footballers were just feeble stick men. But like I said, it was quite addictive, although hardly realistic - Wales are not even good enough to qualify for the World Cup finals nevermind lift the famous trophy! 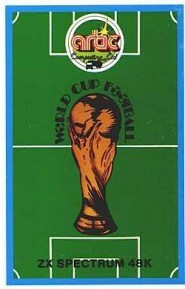 Useless fact: For the 1986 Mexico World Cup, US Gold obtained the rights to sell the only official World Cup computer game - World Cup Carnival. But all they did was basically tart up Artic's two-year old World Cup Football games and chuck in a poster, a wall chart, self-adhesive world cup flags and a sew-on badge. Fooled by the new packaging, many people bought it without realising they already owned the game. Crash called the new release 'awful', awarded it 26%, and advised people to avoid it at all costs! I remember this management game getting quite crap reviews at the time, but I used to like it. Unable to afford full price games, I used to purchase a lot of budget efforts, and this one kept me entertained for hours. I can't remember whether I ever won the old First Division, but I do remember storming through the leagues. One of those annoying games that occassionally crashed when you were doing really well and hadn't saved it for ages, leading to much keyboard bashing on my part. Apart from being released on its own, it also appeared on Alternative's 4-Most Sports compilation in 1991, which I always seem to see at car boot sales or lurking in people's Speccy collections. 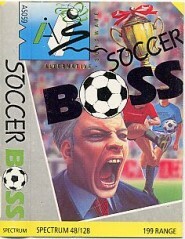 Useless fact: Despite being released in 1987 by Alternative as Soccer Boss, it was actually a rehash of an old Peaksoft game called The Boss, written by Harry Whitehouse, which first appeared in 1984. So now you know. NOTE: There are quite a few Speccy footy games I never played, especially those released in the early 90s. This is just my selection of the best ones I did manage to experience. I expect quite a few of you will disagree with my selection, so feel free to email your top five footy faves to me, and I will print them on this site. Oh and finally, does anyone know why the hell they included that well known athletic pursuit of penalties in Daley Thompson's Supertest? Send your answers here. BUY THESE ORIGINAL SPECCY FOOTY GAMES!! !